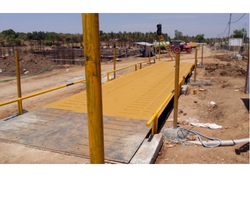 We are a leading Manufacturer of unmanned weighbridge system from Pune, India. Our company is counted among the well known name in the market involved in offering optimum quality Unmanned Weighbridge System to our customers. Suitable for places where there is space limitation. Under the strict guidance of our professionals, this product is manufactured by using premium quality product and latest technology as per the set market norms. Customers can get this electronic weighbridge from us at market leading rates. Looking for Unmanned Weighbridge System ?